We had finished Uncle Tom’s Cabin shortly before the day of our group presentations. The assignment had been to choose an important scene from anywhere in the book, say why it mattered, and act it out. My partners were Norie Cleehan and Jenny Carter, and we did the part where Cassy and Emmeline hide in the attic and pretend to be ghosts to scare Simon Legree; I was Legree. After we went, the only group left was Darden, Aspeth and Dede. “We have to go put on our costumes,” Dede announced. “Great,” Ms. Moray said. No one else had bothered with costumes. They left the room, and while we waited, a generous, giddy energy hung in the classroom—we’d been getting up from our seats and talking in bad Southern accents and clapping for one another at the end of each performance. During one burst of applause I had thought that we were probably making as much noise as one of those classes you hear down the hall—usually while you’re taking a math test—that’s shouting and laughing like they’re at a party. “I must say, I had no idea there was so much acting talent in this class,” Ms. Moray said. Aspeth disappeared, and the door clicked shut. A minute later, Darden flung it open and strode through, Aspeth behind him gripping his waist like in a conga line, and Dede behind Aspeth. Darden wore a fedora set at an angle, a pair of oversized sunglasses, several gold and silver and pearl necklaces, and a long shiny red raincoat, tight across his shoulders, which I recognized as belonging to Dede. In his right hand, he carried a cane. Dede herself had on a cream-colored knee-length silk slip, and Aspeth was wearing a striped bikini top (the stripes were pink, mint green, and pale blue) and a tennis skirt; on their feet, both girls wore high heels. “Choo-choo!” Darden cried. He thrust his fist in the air and rolled it forward a few times, then tipped his head back toward Aspeth and Dede. “Ain’t that the finest-looking ho train you folks ever seen?” From various parts of the table, I heard snorts of laughter, and someone—it might have been Oliver—called out, “Uh-huh, brother!” As if in response, Aspeth and Dede held their chins in the air, moved their heads all around, batted their eyelashes. Jenny had a look on her face that was both startled and amused. Her gaze jumped to Ms. Moray, and when I looked, too, Ms. Moray was squinting as if confused. This was a confusion I shared. I literally did not understand what Darden and Aspeth and Dede were doing, what the unifying principle was behind their weird clothes, their gestures, Darden’s lingo. I sensed that most of my classmates did understand. Jenny puckered her lips and kissed Darden. Darden and Aspeth and Dede regarded her silently. Their posture was already different—Aspeth’s arms were folded, she wasn’t touching Darden at all—and none of them were smiling. “We were just—” Dede began. They walked quickly past us, back into the hall. In their absence, the rest of us looked at one another, looked away, looked back; Chris Graves put his head down on the table. When Darden, Aspeth and Dede returned, they sat without speaking. “Would someone like to explain what that was about?” Ms Mortay said. No one said anything. I couldn’t tell if she was asking all of us or just them, and I also couldn’t tell if she was really asking for an explanation—if, like me, she hadn’t understood—or if she was asking for more of a justification. Of course. I was an idiot. Darden was looking down, and Aspeth was looking across the room, her face blank, her arms crossed again. To watch Aspeth be scolded was odd and not, as I might have imagined, enjoyable. I would have felt sorry for her, actually, except that she seemed unaffected by Ms. Moray’s comments; she seemed mostly bored. Of the three of them, only Dede was looking at Ms. Moray. “We were being creative,” Dede said. Everyone looked her then, even Darden and Aspeth. Racism didn’t exist at Ault. Or it did, of course it did, but not like that. Kids came from all sorts of cultural backgrounds, with parents who had emigrated from Pakistan, Thailand, Colombia, and some kids had families that still lived far away-in my dorm alone, there were firls from Zimbabwe and Latvia. And no one ever made slurs, it easn’t liek yuou got outracized if uou werne’t white. Racism seemed to me like a holdover from my parents’ generation, something that was not entirely gone but had fallen out of favor—like girdles, say, or meatloaf. This was a bold and possibly inappropriate thing to say—Darden’s blackness, in our post-racist environment, was not a thing you remarked on. I glanced at Darden, who was looking down again. He inhaled, puffed out his cheek, exhaled, and shook his head. I didn’t think he was self-hating, and I certainly didn’t want him to be—I was self-hating, and wasn’t that enough? Did there need to be so many of us? “There’s also the issue—” Ms. Moray said, but Darden interrupted her. “We made a mistake,” he said. “How about we leave it at that?” He was looking up at Ms. Moray, his mouth set in a firm line. He seemed to me at this moment like an adult—his deep voice and his physical size and his reasonableness, how it appeared he wanted the situation resolved more than he wanted himself exonerated. I wished that I was friends with him so that I could tell him after class I’d been impressed by his behavior and it wouldn’t just seem like I was trying to get on his good side. Ms. Moray hesitated. It had seemed before that she was just warming up, but this was a relatively easy way out. “Fine,” she said at last. “But I’ll make one more point. And that’s that this wasn’t only offensive in terms of the racial stereotypes you guys were playing off. I’m also deeply, deeply troubled by the sexism here. And, no, the fact that you’re women doesn’t make it okay for you to objectify yourselves. Our culture teaches women that our primary worth is our appearance, but we don’t have to accept that idea. We can flaunt our bodies, or we can choose to have integrity and self-respect.” Ms. Moray’s voice had turned high, she sounded a little too impassioned, and I saw Aspeth roll her eyes at Dede. She shouldn’t have been using the word women, I thought. All of us in the room, except for Ms. Moray herself, were girls. The next day, while we waited before class for the bell to ring, Ms. Moray said, “Who’s psyched to learn?” Then she pretended to be a cheerleader, waving her hands in the air, shouting, “E-N-G-L-I-S-H—what’s that spell? English!” We didn’t have cheerleaders at Ault, and she was making the joke to show that she forgave us; she didn’t seem to realize that she herself had not been forgiven. So, Chattanooga choo choo, won’t you choo choo me home? Is that the Chattanooga choo choo choo choo? So, Chattanooga choo choo, won’t you choo choo me home!? Darden Restaurants, Inc. is an American multi-brand restaurant operator headquartered in Orlando. As of April 2017, the firm owns eight casual dining restaurant chains: Olive Garden, LongHorn Steakhouse, Bahama Breeze, Seasons 52, Eddie V’s Prime Seafood, The Capital Grille, Yard House and Cheddar’s Scratch Kitchen (the latter having been acquired on April 24, 2017). Until July 28, 2014, Darden also owned Red Lobster. Darden has more than 1,500 restaurant locations and more than 150,000 employees, making it the world’s largest full-service restaurant company. As of 2012, Darden is the only Fortune 500 company with its corporate headquarters in Greater Orlando. Christopher Allen “Chris” Darden (born April 7, 1956) is an American lawyer, author, actor, lecturer, and practicing attorney. He was a 15-year veteran of the Los Angeles County District Attorney‘s office, where he was assigned to the prosecution of O. J. Simpson, a role in which he gained a great deal of national attention. Darden was born in Richmond, California, the fourth of eight siblings. After graduating from John F. Kennedy High School in 1974, Darden enrolled at San Jose State University, where he participated in track and field and joined Alpha Phi Alpha, an African-American fraternity. He received his B.S. in criminal justice administration in 1977. Darden received his Juris Doctor from the University of California, Hastings in 1980. Dr. Christine Darden (born September 10, 1942, as Christine Mann) is an American mathematician, data analyst, and aeronautical engineer who devoted much of her 40-year career in aerodynamics at NASA to researching supersonic flight and sonic booms. She had an M.S. in mathematics and had been teaching at Virginia State University before starting to work at Langley in 1967. She earned a PhD in engineering at George Washington University in 1983 and has published numerous articles in her field. She was the first African-American woman at NASA‘s Langley Research Center to be promoted into the Senior Executive Service, the top rank in the federal civil service. Darden is one of the researchers featured in Hidden Figures: The American Dream and the Untold Story of the Black Women Mathematicians Who Helped Win the Space Race (2016), a history of some of the influential African-American women mathematicians and engineers at NASA in the mid-20th century, by Margo Lee Shetterly. Christine Mann was born September 10, 1942 to schoolteacher Desma (Cheney) and insurance agent Noah Horace Mann Sr. in Monroe, North Carolina. The Darden School of Business is the graduate business school associated with the University of Virginia in Charlottesville, Virginia. The Darden School offers MBA, Ph.D. and Executive Education programs. The School was founded in 1955 and is named after Colgate Whitehead Darden, Jr., a former Democratic congressman, governor of Virginia, and former president of the University of Virginia. Darden is on the grounds of the University of Virginia in Charlottesville. Uncle Tom’s Cabin; or, Life Among the Lowly, is an anti-slavery novel by American author Harriet Beecher Stowe. Published in 1852, the novel “helped lay the groundwork for the Civil War“, according to Will Kaufman. Stowe, a Connecticut-born teacher at the Hartford Female Seminary and an active abolitionist, featured the character of Uncle Tom, a long-suffering black slave around whom the stories of other characters revolve. The sentimental novel depicts the reality of slavery while also asserting that Christian love can overcome something as destructive as enslavement of fellow human beings. Stowe, a Connecticut-born teacher at the Hartford Female Seminary and an active abolitionist, wrote the novel as a response to the passage, in 1850, of the second Fugitive Slave Act. Much of the book was composed in Brunswick, Maine, where her husband, Calvin Ellis Stowe, taught at his alma mater, Bowdoin College. Stowe was partly inspired to create Uncle Tom’s Cabin by the slave narrative The Life of Josiah Henson, Formerly a Slave, Now an Inhabitant of Canada, as Narrated by Himself (1849). Henson, a formerly enslaved black man, had lived and worked on a 3,700 acres (15 km2) tobacco plantation in North Bethesda, Maryland, owned by Isaac Riley. Henson escaped slavery in 1830 by fleeing to the Province of Upper Canada (now Ontario), where he helped other fugitive slaves settle and become self-sufficient, and where he wrote his memoirs. 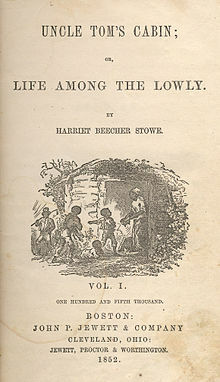 Stowe acknowledged in 1853 that Henson’s writings inspired Uncle Tom’s Cabin. When Stowe’s work became a best-seller, Henson republished his memoirs as The Memoirs of Uncle Tom and traveled on lecture tours extensively in the United States and Europe. Stowe’s novel lent its name to Henson’s home—Uncle Tom’s Cabin Historic Site, near Dresden, Canada—which since the 1940s has been a museum. The cabin where Henson lived while he was enslaved no longer exists, but a cabin on the Riley farm erroneously thought to be the Henson Cabin was purchased by the Montgomery County, Maryland, government in 2006. It is now a part of the National Park Service National Underground Railroad Network to Freedom program, and plans are underway to build a museum and interpretive center on the site. American Slavery As It Is: Testimony of a Thousand Witnesses, a volume co-authored by Theodore Dwight Weld and the Grimké sisters, is also a source of some of the novel’s content. Stowe said she based the novel on a number of interviews with people who escaped slavery during the time when she was living in Cincinnati, Ohio, across the Ohio River from Kentucky, a slave state. In Cincinnati the Underground Railroad had local abolitionist sympathizers and was active in efforts to help runaway slaves on their escape route from the South. Simon Legree on the cover of the comic book adaptation of Uncle Tom’s Cabin (Classic Comics No. 15, November 1943 issue). Simon Legree is a cruel slave owner—a Northerner by birth—whose name has become synonymous with greed. He is arguably the novel’s main antagonist. His goal is to demoralize Tom and break him of his religious faith; he eventually orders Tom whipped to death out of frustration for his slave’s unbreakable belief in God. The novel reveals that, as a young man, he had abandoned his sickly mother for a life at sea and ignored her letter to see her one last time at her deathbed. He sexually exploits Cassy, who despises him, and later sets his designs on Emmeline. It is unclear if Legree is based on any actual individuals. Reports surfaced after the 1870s that Stowe had in mind a wealthy cotton and sugar plantation owner named Meredith Calhoun, who settled on the Red River north of Alexandria, Louisiana. Generally, however, the personal characteristics of Calhoun (“highly educated and refined”) do not match the uncouthness and brutality of Legree. Calhoun even edited his own newspaper, published in Colfax (originally “Calhoun’s Landing”), which was renamed The National Democrat after Calhoun’s death. However, Calhoun’s overseers may have been in line with the hated Legree’s methods and motivations. Arthur Shelby – Tom’s master in Kentucky. Shelby is characterized as a “kind” slaveowner and a stereotypical Southern gentleman. Emily Shelby – Arthur Shelby’s wife. She is a deeply religious woman who strives to be a kind and moral influence upon her slaves and is appalled when her husband sells his slaves with a slave trader. As a woman, she has no legal way to stop this, as all property belongs to her husband. George Shelby – Arthur and Emily’s son, who sees Tom as a friend and as the perfect Christian. Simon Says (or Simple Simon Says) is a child’s game for 3 or more players where 1 player takes the role of “Simon” and issues instructions (usually physical actions such as “jump in the air” or “stick out your tongue”) to the other players, which should only be followed if prefaced with the phrase “Simon says”. Players are eliminated from the game by either following instructions that are not immediately preceded by the phrase, or by failing to follow an instruction which does include the phrase “Simon says”. It is the ability to distinguish between genuine and fake commands, rather than physical ability, that usually matters in the game; in most cases, the action just needs to be attempted. Richard Craig Shelby (born May 6, 1934) is an American politician serving as the senior United States Senator from Alabama. First elected to the U.S. Senate in 1986, he is the Chairman of the Senate Committee on Rules and Administration. He also serves on the Senate Appropriations Committee and the U.S. Senate Committee on Banking, Housing, and Urban Affairs.